A Cup of Kindness « What's a Girl to Do? This entry was posted in Creativity, Holidays, Music, Turning Points and tagged Auld Lang Syne, New Year's Eve, New Year's Resolutions. Thanks for the lovely, heartfelt article. 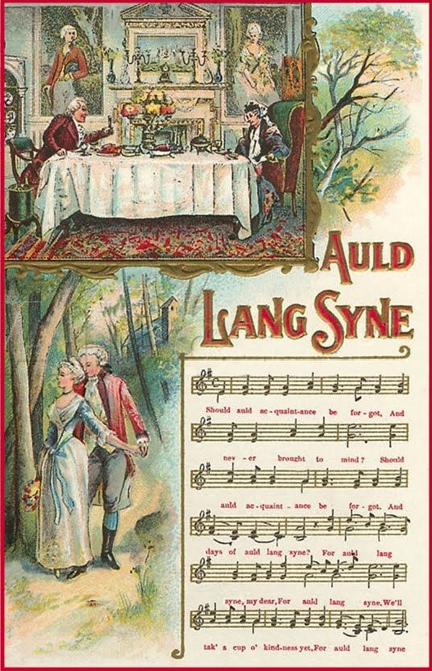 I will think about Auld Lang Syne in a new way now. My word for 2018 is kindness! My mother’s sister, Lucia, who spent a week with us at the Farm years ago, will be 100 on Jan 28th. She had a stroke recently but is in a rehab now and we hope to bring her home. Your story about your time caring for your mother resonates with me. It is not an easy time. Thanks and happy new year! I wish you not just kindness but patience, Debbie. It sounds as tough Lucia is well loved. Well said, Tinky, and the vintage ephemera help enhance the message even more. I’m delighted to learn that Robert Preston’s 100th birthday takes place this year. I’ve been a big fan of his musical AND fun-filled acting for years. Perhaps his films will materialize on Netflix? Best wishes & good cheer to you for 2018! We can only HOPE he’ll show up there, Sara. Thanks for visiting! Lovely thoughts as we enter 2018! A very Happy New Year, Tinky! I know those around you will experience that cup ‘o kindness! Hope the cold isn’t too much! I read your essay (?) 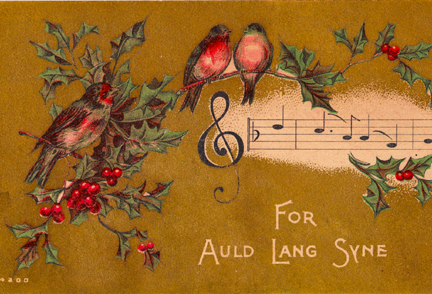 about Auld Lang Syne, and used it as an excuse to research a little about why so many Scottish words sound German, or are of obvious German origin. I’ve thought that question to myself about 1000 times in my life but never did anything about it until tonight, so about an hour and half ago I went off on that tangent. The best solution I could come up with is the fact that English is itself a Germanic language and the Scots have retained a lot of German pronunciations while the English speakers changed words over time to “English” spellings and pronunciations. So now I finally know, or at least have an answer that satisfies me enough so I won’t wonder the next time I hear someone speaking English with a Scottish accent and they sound like a German to me. I actually indented to go to bed fairly early tonight, but instead I have a satisfactory answer to a long time puzzle, for which I have you to thank, as for some reason I simply could not put off answering my long time query any longer. There is something about your writing that answers questions for me, or encourages me to finally solve a mystery or puzzle that has been bugging me for a long time. Thanks and new year’s wishes to you all! Jean, I’m honored that my writing gets you thinking…. Stay warm yourself, Buckey! It should get warmer EVENTUALLY….